From the blurb for this second novel from Sydney writer Stephanie Bishop, I had thought I might identify with the protagonists, a Cambridge couple who migrate to Australia in the 1960s. But no, while this is an absorbing meditation on belonging, nostalgia, and motherhood, I found the central character Charlotte to be, as my mother would say, a bit of a misery and weak and selfish into the bargain. I might be selfish sometimes, as we all are, but this character’s way of dealing with her own unhappiness is on a scale that I have no patience with at all. I don’t need to ‘like’ a character to admire a book, but I suspect that some to whom this book is marketed will focus on Charlotte’s deficiencies as a human being and perhaps overlook the fine writing, the carefully-paced structure and the occasional striking metaphor. (Women in armoured bathing suits… yes, so evocative of the middle 60s!) 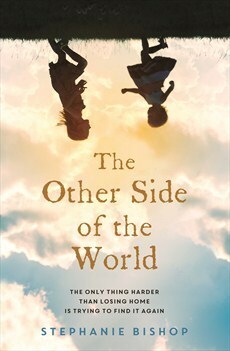 The Other Side of the World reminded me of Ian McEwan’s On Chesil Beach in the way that the small domestic tragedy derives from the failure of the characters to communicate with each other. Charlotte and Henry say they love each other and there are numerous touching moments of intimacy, but they don’t ever discuss their inner demons, their desires or ambitions, and it is left to Henry to blunder about trying to make decisions ‘for the best’ for his family – without ever having any understanding of his wife’s unhappiness. Unattractive aspects of Charlotte’s character begin to surface. In the beginning the reader pities her, but her judgemental attitudes towards the suburban women she meets expose her sense of superiority. She doesn’t understand the mash of vowels when she asks for directions, and she sits aloof at playgroup because she knows the other women don’t really want to hear about her children, they only want to boast about their own. She never speaks to the women who live next door. Whether the author intended to reveal this or not, her character Charlotte has brought her British class consciousness with her, and it’s only partly offset by the casual racism that Henry experiences when his colleagues discover that the academic with the British name and qualifications has dark skin. When she finally meets someone who understands about art, Charlotte flirts with him and what happens eventually is entirely predictable. Not so predictable were Henry’s travails at work and his sudden departure to India when his mother is dying, and Charlotte’s astonishing self-indulgence. It is one thing to lose patience with small children when they are being bratty, and another thing entirely to inflict grievous cruelty on very small children for a sustained period of time. Her behaviour only seems credible if the reader grants her a diagnosis of mental illness because the author doesn’t make a convincing case that it derives from Charlotte’s frustration about her marriage and the children denying her identity as an artist. But really, for most of us who are parents, what this character does is simply inexplicable. Do read Dorothy Johnson’s review at The Age/SMH. Good review, though I think I’ll skip the book. I was a young father in Perth in the late 1970s and we had baby health care nurses, not play groups. Try The Shark Net for a picture of Perth suburbs in the 60s by someone who was really there. I’m ashamed to say that while I’ve read four titles by Robert Drewe, I haven’t read this one. LOL Maybe it’s time I started tackling my D shelf on the TBR now that I’ve got the Ms more under control…. *chuckle* You notice how cunningly I have not told you what Charlotte does that is so awful. You have to read it, of course you do! Thanks for the mention and the link, Lisa. Just a small correction – my review was written for the Age and Sydney Morning Herald, not the Sydney review of books. I was less critical of Charlotte than you have been. She came across as truly a ‘lost soul’ to me. But I take on board the points you make, and I was very interested to read about your own experiences as a child arriving in Australia from ‘the other side of the world’. Oops, sorry, Dorothy, I’ll fix that attribution right away. Thanks so much Lisa. I was thinking of reading this but I’m pretty sure I would feel the same way about it as you did, so won’t. Oh, don’t let me put you off, have a look at Dorothy’s review too, please! Great review. After reading yours and Guy’s I think Charlotte would get on my nerves. PS : international phone calls were still very expensive in the 1980s, so they must have been in the 1960s too. Ah ha, I thought so. My guess is that young authors (and editors) would just assume that you could phone anywhere anytime, whereas it wasn’t like that at all. Even ISD (interstate dialling) was expensive when I was a young woman on a budget, and you could see the impact of just one call on the phone bill. And so you thought about it, carefully, before you made that call, and you had to go without something else, to set aside the money for when the bill came. I had exactly the same thoughts about lack of thorough research. I don’t think playgroups as described in the novel existed back then, and magnetic fridge magnets were much later. International phone calls and travel were similarly well out of the reach of ordinary migrants. Even in the 1970s, calling the UK was an expensive exercise we would do once a year at Christmas. I think this is where good editors come into their own. Sometimes an author doesn’t know that they need to research something… and sometimes it’s excusable. I was discussing this in the context of Ouyang Yu’s novel Billy Sing with Janine from The Resident Judge of Port Phillip (https://residentjudge.wordpress.com/2017/04/17/billy-sing-a-novel-by-ouyang-yu/#comment-8691). Ouyang Yu has a Chinese-Australian may not have known that the bodies of the Anzacs were not repatriated after WW1 because it was thought to be too expensive. But his editor should have known it and picked it up, and it would have bene easy enough to check the facts and get it right. An older editor (or an older reader of the MS) would have queried these anachronisms in Bishop’s novel and that would have triggered the necessary research.